In a Site Collection in SharePoint 2016 we have successfully added a crawled property which we can find in the crawled properties list of the Site Collection. Now we want to edit one of the customizable Refinable managed properties (RefinableString00) on site collection level. There is no edit option. On the Managed Properties page, in the Managed property filter box, type the name of a refinable managed property — for example, RefinableString00 — and then click the arrow. Having clicked the arrow there is only an option to "view". See screenshot below. We expect an option to edit here because we need to add a mapping to a crawled property. We have tried this with several users going all the way up to Site Collection Administrator level. It is possible to do these things for the central search application but we want the ability to do this for a specific site collection as described in the technet article. Not possible in SharePoint 2016? 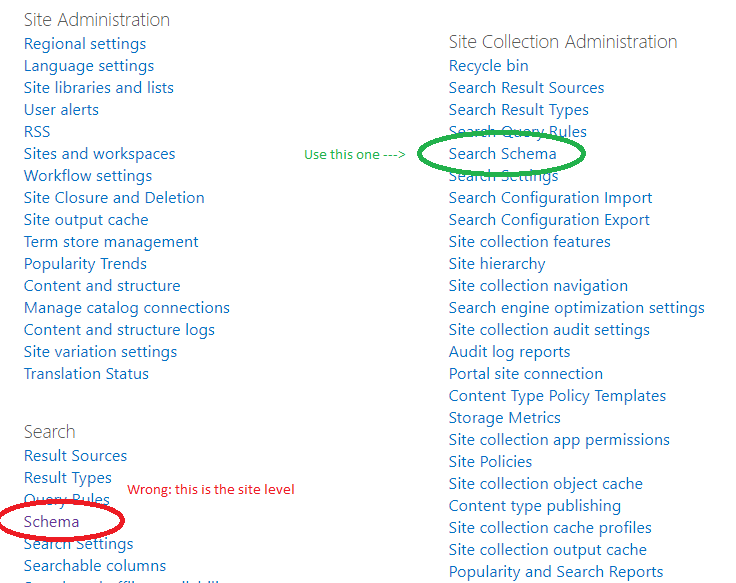 From Site Collection Administration go to "Search Schema" in the "Site Collection Administration column. Here the settings can be edited. It turned out that we clicked the (very similar) "Schema" in the column "Search". This does apparently not refer to the Site Collection search settings even though we were at the top level settings of the Site Collection. Not the answer you're looking for? Browse other questions tagged search 2016 managed-property refiner crawled-property or ask your own question.